Sophomore point guard Jamaryn Blair scored a season-high 18 points Saturday night as Bradley Central beat Sullivan Central, 55-37, to win their fourth straight Holiday Inn Express Thanksgiving tournament championship. Blair had scored just 13 points in the previous two tourney games. CLEVELAND, Tenn. – Bradley Central went from an ugly duckling to a pretty nice prom date in a matter of seven hours on the same day. After notching an ugly 55-37 win over Daniel Boone in 10 a.m. opener in the 19th Holiday Inn Express Thanksgiving semifinals, the Bearettes played perhaps their best game of a rocky start to the season in thrashing Sullivan Central, 55-37, Saturday night to win their fourth straight championship and seventh overall in the long-running two-day event at Jim Smiddy Arena. “Well, it wasn’t a Mona Lisa,” Bearettes coach Jason Reuter said of the morning victory over the Lady Trailblazers. Reuter must have lit up the locker room at the break. Was that really what Reuter wanted to say or do? A primary factor in the nightcap win was sophomore point guard Jamaryn Blair breaking out of a season-opening funk with a game-high 18 points, five rebounds, all on the offensive boards, four steals and three assists. Another reason the Bearettes won was drastically whittling down their ball-handling mistakes – a combined for in the first two games of the tournament. They got out of the title game with only six miscues, while the defense forced Sullivan Central (4-1) into 21 turnovers. After shooting 25 percent in the first and second quarters, Bradley Central wound up hitting 23 of 65 shots for 35 percent. However, it was another paltry effort from 3-point distance as the Bearettes went 3 for 26 (11.5 percent). Hey, that was a better percentage by double digits than in the first 16 minutes when the Bearettes were 0 for 12. Throw in Blair’s early season breakout performance and the Bearettes had the winning remedy. Blair had that trademark pep in her step back and mentally she left the arena in a better state of mind. Reuter looked at the statistics sheet after the game and saw a smaller number alongside Blair’s name. “That’s the biggest thing I’m proud of, one turnover,” he said. “It’s the best game she’s had all year and we’ve been waiting on this. As a sophomore, the pressure of coming in and starting and starting at point guard for Ryne (Howard) can be a bit overwhelming at times. Nursing the one-point lead coming out of the locker room at halftime, the Bearettes outscored the Lady Cougars, 13-2, and extended the margin to 32-20 and Blair had six points in the offensive spree. Bradley enjoyed a 19-9 advantage in the third quarter and had a 38-27 cushion. Blair and Hannah Lombard drained back-to-back 3s to start the final period. After Sullivan countered with two free throws by 6-4 junior Abbey Crawford – she had a team-high 17 points. Up 47-32 midway through the quarter, Bradley’s Anna Roberts hit a layup and Walker added two more and the lead ballooned to 53-34. Walker, Blair and Hughes earned spots on the all-tournament team. 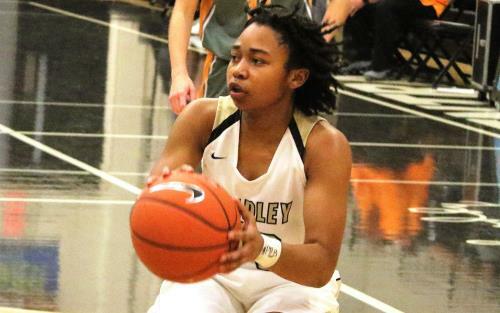 Bradley Central 55, Daniel Boone 42: With Reuter’s not a Mona Lisa assessment out there, the simple fact was his Bearettes turned in their second straight less-than-stellar performance in the semifinal showdown. The forthright critiques of Bradley’s efforts were not lost on the players, either. Lombard was 0 for 2 from the field, but was 6 for 8 at the stripe to help hold the aggressive Trailblazers at bay in the fourth quarter. Walker figured prominently down the stretch, by dropping six of her game-high 17 points – she also had 11 rebounds – late in the fourth quarter. Walker started the Bearettes’ final 12-point surge with a put-back goal with 3:02 on the clock and ended it with a layup with 0:02 seconds remaining. The Bearettes committed 23 turnovers, the same number as Daniel Boone, and Walker had five. Blair had four and Hughes and Jamia Williams three apiece. “It’s been a couple years since that’s happened,” said Reuter, referring to the turnovers. “Daniel Boone is not a bad team – they’re the best team we’ve played – and they play physical, but that’s too many turnovers. I’ll take the blame for that. I’m the maestro and the players are the orchestra. Hughes got the Bearettes off to a quick start, scoring all 10 of her points and Bradley had a 14-12 lead after one quarter. That was an indication the game would be a huge challenge. Bradley was up 29-23 at halftime. The Bearettes pushed the margin to 33-23 on a field goal and two free throws in the third period. The two Walker free throws after Trailblazer coach Beau Hauldren was hit with a technical foul with 3:58 left in the period. “Let me do my job,” the official repeated. Whatever Hauldren said in the next five seconds resulted in the technical foul. Walker hit two free throws from the technical, but missed the next two. Daniel Boone scored twice and Williams hit a field goal, Roberts made a free throw, Williams added a layup and Bradley’s lead was 38-26. 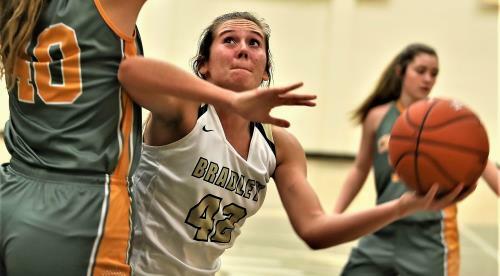 The Trailblazers cut Bradley’s lead to 43-36 early in the fourth period on two free throws by Bayleigh Carmichael, a 5-10 senior guard who had 15 points on 4 of 17 shooting – she was 1 of 12 from 3-point distance. Following a three-plus minute dry spell for both teams, Walker started the Bearettes’ final push to the victory. Jaycie Jenkins paced the Trailblazers with 16 points, but like Carmichael, had a tough shooting game and hit only 5 of 12 field goal attempts. Sullivan Central (37) – Sams 5, Robinette 1, Avery Leming 11, Hurd, Abbey Crawford 17, McClellan 3, Horne, Niebruegge, West, Moody, Lambert, Harrison. Bradley Central (55) – Hughes 4, Roberts 3, Anna Walker 10, Jamaryn Blair 18, Lombard 5, Hullender, Williams 2, Reuter, Mayo 7, Barnes 6, Carman, Crittenden, Estrada, Falcon. 3-Point Goals – Sullivan Central 5 (Leming 3, Sams 1, McClellan 1), Bradley Central 3 (Blair 1, Lombard 1, Mayo 1). Daniel Boone (42) – Runnels 2, Gibson 2, Jaycie Jenkins 16, Bayleigh Carmichel 15, Clark 2, Dietz, Stevens 5. Bradley Central (55) – Kaleigh Hughes 10, Roberts 5, Blair 2, Anna Walker 17, Lombard 6, Barnes 2, Mayo 3, Jamia Williams 10, Reuter. 3-Point Goals – Daniel Boone 3 (Jenkins 2, Carmichel 1), Bradley Central 4 (Hughes 2, Walker 1, Mayo 1). Sullivan Central (47) – Sams 7, Robinette 2, Leming 7, Hurd 5, Abbey Crawford 20, McClellan 6, Horne. McMinn Central (36) – Carlie Runyan 10, K. Baker 2, Melia Baker 13, Smith, Beaty 4, Crabtree 4, Buckner, Rule 3. 3-Point Goals – Sullivan Central 1 (Leming 1), McMinn Central 3 (Runyan, M. Baker, Rule). Eagle’s Landing (52) – Weronicka Hipp 15, Queen 5, Beard, Barnett 6, India Bellamy 24, Bria Bellamy 2. Grace Christian (47) – McReynolds 6, Peters, Duggins 7, Taylor Carter 21, Campbell 4, Barfield, Hammond 5, Stewart 4. 3-Point Goals – Eagle’s Landing 2 (Hipp 1, I. Bellamy 2), Grace Christian 7 (Carter 5, Duggins 1, Hammond 1). Collierville (41) – Mallory Taylor 13, Anandi Farrell-Rosseau 11, Rodgers 2, D. Amaefula 8, Robinson 4, Jones, Pham 3, Brown, M. Amaefula. Creekview (48) – Hannah Fitzgereald 16, Craft 4, Wilkie 4, Waters 7, Josie Johnson 14, Mason 3, Pridemore, Pearce. 3-Point Goals – Collierville 3 (Taylor 1, Farrell-Rousseau 1, Pham 1), Creekview 2 (Fitzgerald 1, Waters 1). McMinn Central (50) – Carlie Runyan 18, K. Baker, Melia Baker 14, Smith, Beaty 9, Crabtree, Buckner 2, Rule 7. Daniel Boone (55) – Runnels 6, Gibson 5, Jenkins 9, Bayleigh Carmichel 17, Clark 6, Carroll, Casey 3, Sanders, Dietz 2, Stevens 7. 3-Point Goals – McMinn Central 1 (Rule 1), Daniel Boone 4 (Jenkins 2, Carmichel 1). Junior post Anna Walker of Bradley Central tries to shoot around Sullivan Central's 6-foot-4 post Abbey Crawford on Saturday in the Bearettes' Thanksgiving tournament title game at Jim Smiddy Arena. Bradley won, 55-37, and Walker was named the MVP.